"OLD STYLE AUTHENTIC HUNTING SAFARIS"
Your Namibian safari will include plains, and in some cases dangerous game, or even both. Currently Estreux Safaris have hunting concessions in the Central, Central North, North Western, and North Eastern parts of Namibia. Your trophy list of preferred animals will determine the choice of hunting area/s. Whatever you as our valued client decide, we will assist you in finding the right combination of hunting days and hunting area/s as to experience your ultimate African Safari. In both these wilderness concessions, all game is free range with NO fences. For plains game we use our Kaokoveld wilderness concession and for dangerous game the Caprivi wetland concessions as mentioned below. All game in the Kaokoveld and Caprivi is on a strict quota available from the Ministry of Environment and Tourism, therefore it is imperative to book early to prevent disappointment. We do however have other concessions, (Free range and Fenced) but this is mainly to offer game not found in our two main concessions or where we have limited quotas available and/or for sustainability purposes; as we are committed to the long-term sustainability of our game and to ensure the best possible trophy quality. Due to the habitat diversity of Namibia it is impossible to hunt all of the endemic species in one specific area of the country. Estreux Safaris is constantly sourcing new areas to hunt for the best possible trophies in their natural environment. With regard to Dangerous game, Estreux Safaris in conjunction with our partner offers Elephant, Cape Buffalo, Leopard, Crocodile and Hippopotamus. Depending on available quotas as agreed by the Ministry of Environment and Tourism limited quotas on Lion and White Rhino are also offered. Estreux Safaris guarantees exclusivity in all their concessions, with you and your hunting party having the entire concession to yourselves. We only take one group at a time. Our concessions cover approximately 870 000ha or 2,100 000acres with more than 35 species available in very remote and pristine "wilderness" areas. 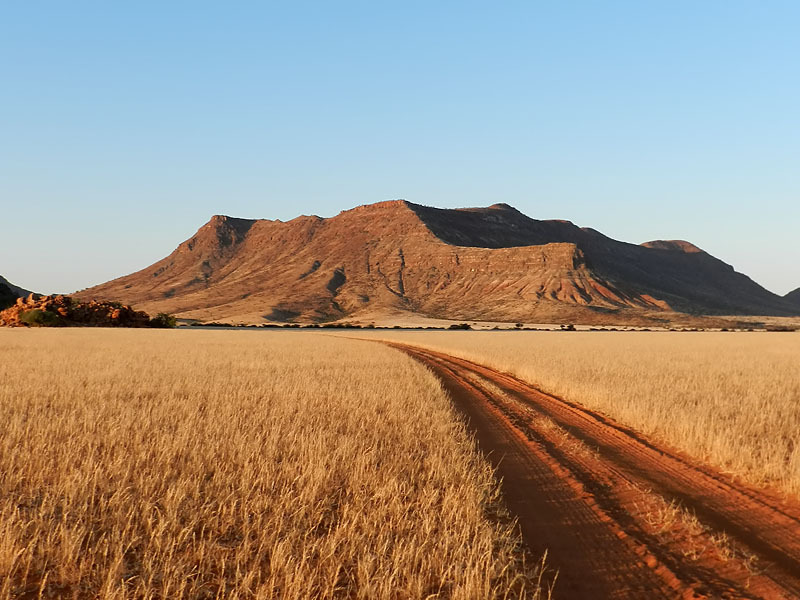 Your hunt will also benefit marginal communities in the north-western and north-eastern corners of Namibia. Estreux Safaris is committed to the long-term conservation and social upliftment of the people in the areas where we hunt. 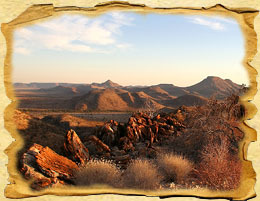 This hunting concession of which Estreux Safaris have the sole hunting rights, includes the vast and remote Orupembe, Sanitatas and Okondjombo Communal Conservancies in the hart of the Kaokoveld of north western Namibia and covers more than 665 000ha or 1, 600 000acres of unfenced pristine wilderness, rich in wildlife and sparsely populated by Namibia's last true indigenous traditional tribe, the semi-nomadic Himba. 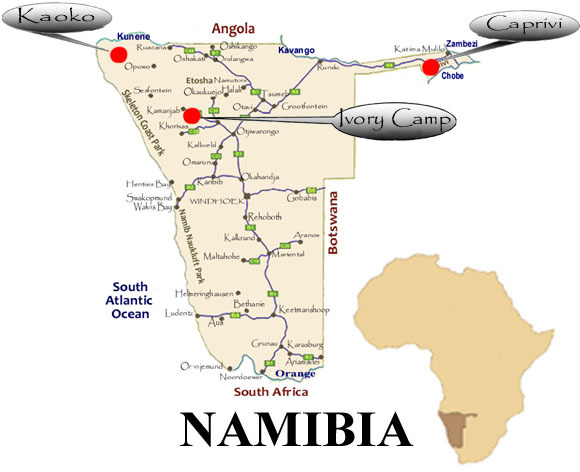 To the north it borders Angola on the Kunene River and to the west the famous Skeleton Coast National Park. The Kaokoveld is a place far remove from civilization. A place of silence, and magnificent solitude, timeless with horizons that expand into infinity. Exceptionally beautiful, with nuances and vistas of colors and the moods of its ever-changing landscapes, found nowhere else on earth. This most unusual of desert environments in the world, with ephemeral rivers, rugged mountains and vast endless plains. 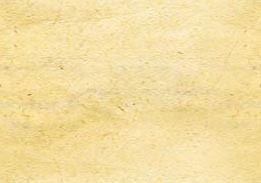 Seemingly lifeless; prehistoric plants, desert adapted wildlife and semi-nomadic Himba live in harmony with each other. Estreux Safaris have the exclusive hunting rights and will conduct most of their plains game wilderness hunting safaris in this concession. 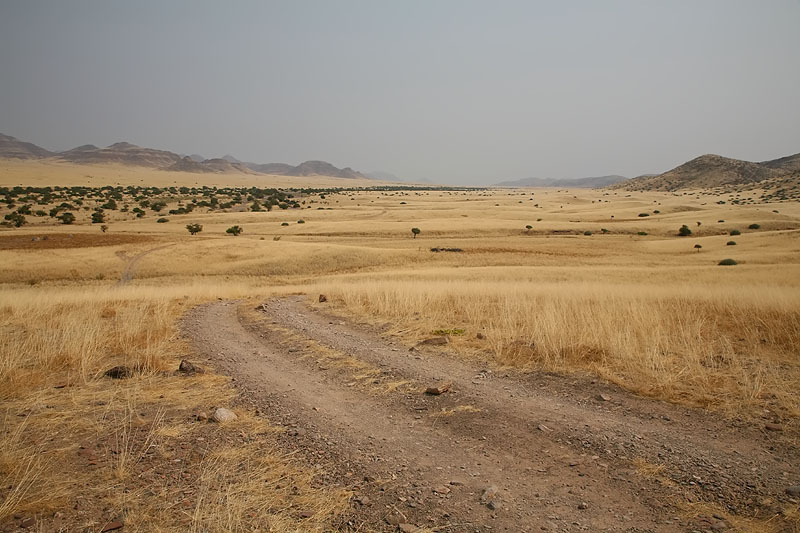 This concession is ideally suited to the first time, but even seasoned African hunter. Hunters are however advised to be fit as all hunting is done on foot and vast distances will be covered on a daily basis to get your quarry. It can either be reached by road or by private air charter. NOTE: Please note that clients should allow for one and a half days driving up to the Kaokoveld and one and a half days driving back to Windhoek with one night sleep over en-route both ways upon, which the full accommodation is at his/her own cost. 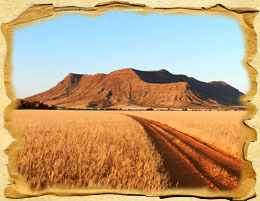 Client's safari starts upon arrival in the Kaokoveld and ends upon leaving the Kaokoveld. Day of arrival and day of departure does not count as hunting days, as arrival and departing times of transfers to hunting camps and back does not allow for hunting on the specific days. Guest will be accommodated at House on the Hill camp while travelling through this vast wilderness. Our dedicated professional staff compliment is also small as to make sure that our clients can relax without any external disturbances. Home cook meals are expertly prepared by our professional chef. Venison from the hunt is always served, accompanied by a variety of vegetables, salads and fruit. We offer a healthy breakfast and three course gourmet treat for dinner. Lunch packs is at the order of the day as hunters will normally spend the whole day in the bush. Top quality South African wines, brandy, whiskey, vodka, gin and world-class Namibian beer, as well as a variety of soft drinks are available in camp. 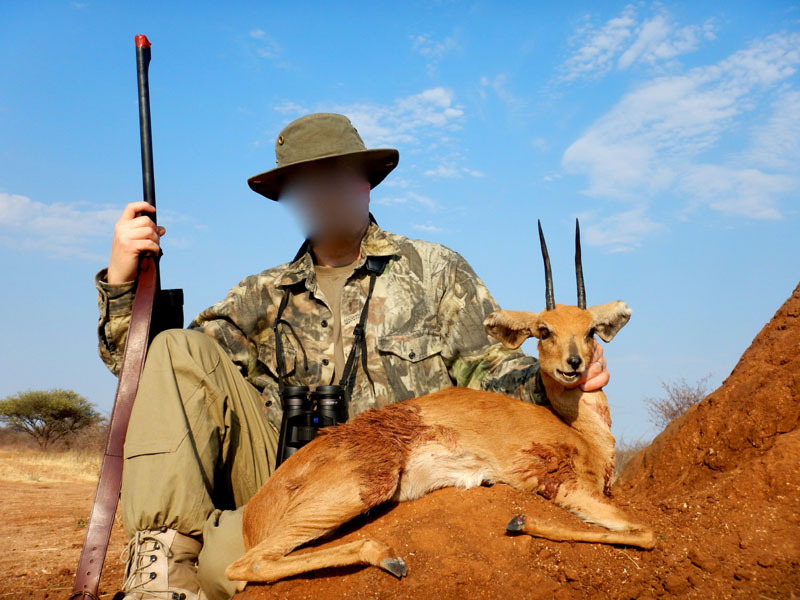 Ivory Camp Hunting Concession: Our Hunting Ranch, is situated some 500km northwest of the capital Windhoek, close to the town of Kamanjab in north western Namibia, mecca of plains game hunting on farms in Namibia. The farm is not game proof fenced, therefore all game are free ranging. Our malaria free private property is 12,300 acres (5,000 hectares). It forms part of the Loxodonta Africana Conservancy, which covers more than 650,000 acres (263,000 hectares), which comprising fifty-one privately owned properties, including ours. We hunt our own property, have exclusive hunting rights on several others and have access to hunting on the entire conservancy. 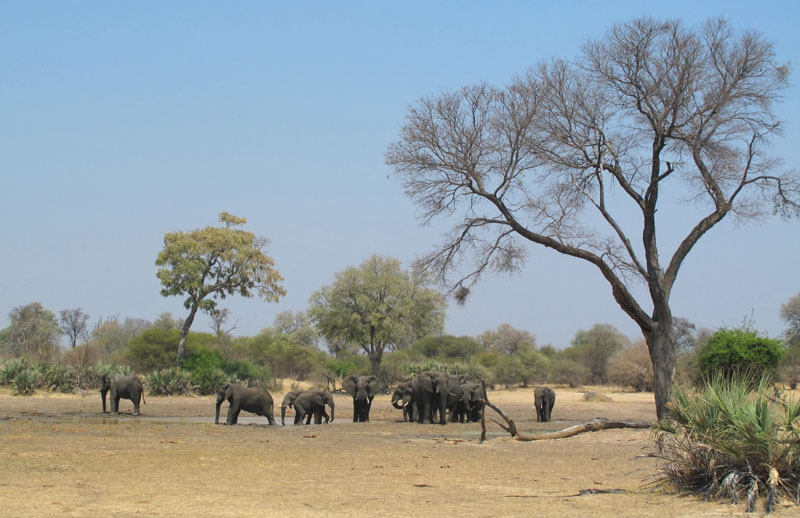 The concession is characterized by typical granite kopjes, mopane and thorn-bush savannah with large ephemeral dry river systems, that crisscross through the area. All game on the property is free range. Ivory Hunting Camp: We have a warm and intimate beautiful hunting lodge overlooking a very large lake, with all of the old world charm of an elegant hunting camp of a past era and the convenience of a modern hunting lodge. We have tried to strike the perfect balance between being as close to nature as possible with the comforts that make life easier. We have three charming and well-appointed thatch roof bungalows that sleep two people each. Our solar powered private bungalows are spacious, modern, clean and very comfortable, all with en-suite bathrooms. We are here to attend to your every need as well as our warm and friendly staff who provide daily maid and laundry service. 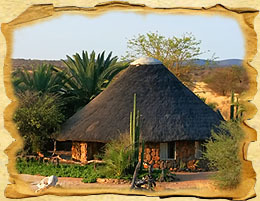 We eat under our elegant and comfortable thatched roof lapa in our open plan dining room and lounge area. Every night we spend the evenings under the stars marveling at the Milky Way around the fire pit enjoying camaraderie and sharing some stories. Our camp is lit with candles in the evenings, which beckons us back to times gone by and a peacefulness prevails. We want you to really leave the world behind and be able to immerse yourselves in the wondrous and magical experience of being in Africa. Game found on the property includes Aardwolf, African wild cat, Baboon, Bat-eared fox, Caracal, Cheetah, Damara Dik-Dik, Duiker, Oryx, Giraffe, Jackal, Hartmann zebra, Klipspringer, Leopard, Kudu, Brown Hyena, Ostrich, Springbok, Red Hartebeest, Warthog and Steenbok. 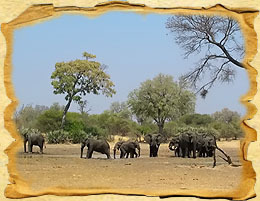 Elephant quite frequently roam the area and their tracks will be observed on a daily basis. 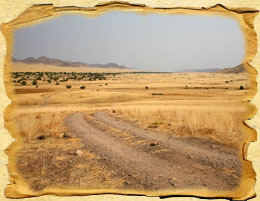 This concession is ideally suited to the first time, but even seasoned African hunter. It also lends itself very nicely for family groups with children. All hunting is done on foot. It can either be reached by very good road or by private air charter i.e. Kamanjab dirt air strip 40km from Ivory Camp. 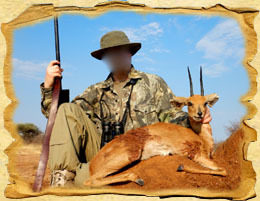 Estreux Safaris offers dangerous game hunting safaris primarily in the East Caprivi of North Eastern Namibia, but can also offer hunts in other pats of Namibia depending on game availability. 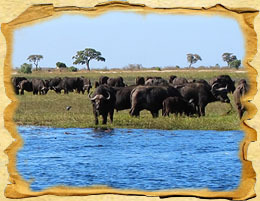 Habitat range from floodplains with deep water channels bordering the Zambezi and Chobe rivers to dry woodland savannah along the Kwando River and Chobe Rivers. Whilst most of the hunting is done on foot, transfers are primarily by boat early in the season and clients should expect to get their feet wet in pursue of especially Cape buffalo, hippopotamus and crocodile, which are all hunted from July through to October. Elephant are normally hunted later in the season i.e. August through to October when most of the areas are a little bit drier. Clients are advised to fly from the capital of Namibia, Windhoek, with Air Namibia to the Caprivi. The two-hour flight is comfortable. Alternatively clients can drive up by vehicle, which will take approximately 13-15 hours, with the added bonus of the scenery along the way. Clients should allow for a sleepover along the way depending on their departure times from Windhoek. NOTE: Please note that Air Namibia only flies at specific days to Caprivi and only in the mornings; therefore clients must check availability of flights beforehand. Please contact us for more information on our Hunting Concessions and a customized Package rate.